Sports documentary filmmaker Ron Yassen found a fun subject in Crossroads. In fact he himself is doing something here somewhat like Bobby Selkin. Bobby was a successful Jewish ophthalmologist bored with his repetitious professional routine performing LASIK surgeries. He found a highly rewarding and soul-satisfying new thing at Charlotte Secondary School. The 200-student North Carolina charter school, where his daughter happened to be a student, is mostly a haven for boys whose personal and academic problems have led them to bomb out at regular larger schools. At Charlotte Secondary, Bobby coaches some of them in lacrosse, and saves them and himself. Yassen was a very successful and busy sports filmmaker. But here, he finds something that's not commercial or mass appeal but heartwarming and fun, a personal satisfaction. Lacrosse was originally a Native American game but it's become very much something preppy white boys do, especially in Maryland. The American Lacrosse Association however, makes it a practice to provide free equipment to needier schools to promote the game. They supplied such supplies to Charlotte Secondary, and at the request of Teddy Walker, head of athletics, relayed by Bobby Selkin's wife, Bobby came to coach the sport. The program begins in 2015, more as a lacrosse club, not a team. The boys he coached have never played lacrosse. But Bobby soon sees that he has some talent on his hands. And in a couple of years of hard, continual work, the lacrosse team at Charlotte Secondary that Bobby Selkin built beat teams made up of players who had been brought up in lacrosse all their lives. This is a coming-from-behind sports success story, and also the story of a burnt-out ophthalmologist who found a new love and a new family. This documentary is very similar in subject to Suzannah Herbert's Wrestle (SFIFF 2018), and invites comparison with it. Wrestle concerns a driven, motivated young white coach at a high school in Alabama. The team becomes the state champions. This achievement not only gets many of the young players from poor black backgrounds into colleges. It very nearly saves the school, which is going under and about to be closed. Bobby Selkin need not save the Charlotte Secondary School. But he is giving his players a motivation at school and a springboard to college admission. The handful of key players the film follows all get into college with scholarships. This is not without a struggle. They come from deep poverty, and their early years have left them with inner pain or other handicaps. Crossroads has some scenes of parents. We get to know the personalities of key players, handsome and charismatic as they are, and capable of great end-of-game speeches to teammates. But we do not delve into the athletes' family lives quite as much as Wrestle does. Lacrosse isn't as clear or dramatic a sport to watch as wrestling. On the other hand, the coach-team relationship here is more loving and intense. In Crossroads Bobby brings the players into his big new house and treats them just like family. He loves them, and he says so. The film shows this. Bobby's success with the boys is impressive, and so is his passion. After the five original key players graduate, they leave a big void. Bobby promotes the best three remaining players to captain status, but they seem unable to provide strong leadership, and in the first few games, the Charlotte Secondary lacrosse team is a loser. Bobby steps in with strong speeches, and the team has a long string of wins. Sadly, Teddy Walker, the head of athletics who created the lacrosse program, is suddenly diagnosed with Stage Four pancreatic cancer. The rest of the games are dedicated to him. There is a visit by the team to an emaciated Mr. Walker to give him the winning ball. Ultimately he doesn't make it, and the film is dedicated to him. The final game is not a win, but a loss to Cox Mill, the best team, 6-2. But this is Cox Mill's weakest score, so for Bobby it's a victory. It's clear that this film is about the boys and Bobby Selkin. We see what rewards Bobby reaps in fathering these boys, creating a successful team, and finding a new passion. 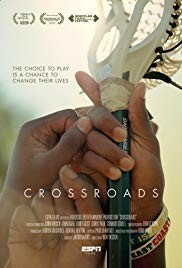 Crossroads is a heartwarming and enjoyable little film. Crossroads, 76 mins., debuted Apr. 2018 at Tribeca, also playing at other festivals, including Nashville. . An ESPN Films release. Also playing as part of the Tribeca/ESPN Sports Film Festival. It was screened for this review as part of the San Francisco Jewish Film Festival, playing at CineArts, Palo Alto Sat. 21 Jul. at 4:15 p.m.; at the Castro Theater, San Francisco, Sat. 28 Jul. at 4:00 p.m.; at the Albany Twin, Albany, Sun. 29 Jul. at 4:45 p.m.; and at San Rafael, Sun. 5 Aug. at 2:05 p.m.